February has just finished, and while it's a "short" month, there was no shortage of new projects added to the Little Things To Sew Cover to Cover Challenge Flickr pool. We've also welcomed a few new competitors and now have 52 of us who have contributed photos to the Flickr pool and a total of 342 photos as I type. For my part, I couldn't let the recent birthday pass with only one item from the book sewn. My parents were planning on giving A a watercolour paint set for her birthday and so I made an Art Smock for them to wrap with it. My mother in law wasn't in on the sideways gifting and was very complimentary about the smock without knowing I'd made it. I think she even tried showing me the seam finishes before I had to spill the beans! But seriously, the seam finishes are divine. 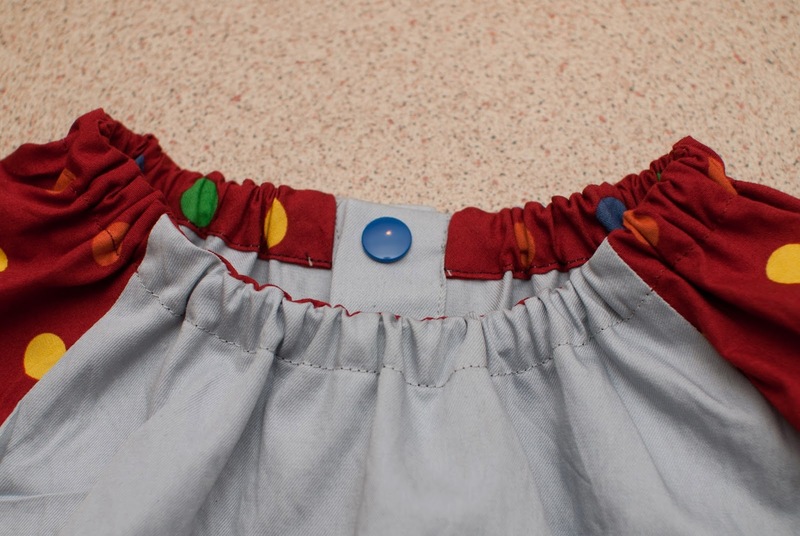 I would never have thought an Art Smock required French seams but now I can't imagine not doing it. Even better, I now know where I have a handy, written reference for how to do French seams without having to search for the Oliver + S blog tutorial. While I don't expect anyone would ever notice that kind of detail, it makes me happy knowing it's there. It also makes me super happy to see everyone sewing little projects. Perhaps you would have anyway, or perhaps you chose to make something just to tick it off. Just look at all the ticks on the scoreboard! Link to PDF here in case the preview is too small to read. I added a tally at the bottom of each pattern. Not surprisingly the Reversible Bucket Hat is the most sewn, closely followed by a tie between the Tutu and the Mittens. Obviously, we're going to have our first finisher cross the line pretty soon (20 projects down and only a Travel Quilt to go for mama_knowles03), but for the rest of us there's still 6 months of sewing to go. Every project counts! Happy sewing one and all. P.S. Here's the link if you want to learn how to embed PDF's in a blog post using Google. Or rather, there's the link for me when I forget how to do it again next month! It is adorable!!!!! I'd love to make this though I think I'll be doing the tutu next. Thank you. Oh, you'll love the tutu. It's such an interesting exercise in colours when you combine the layers. Enjoy! Very cute! 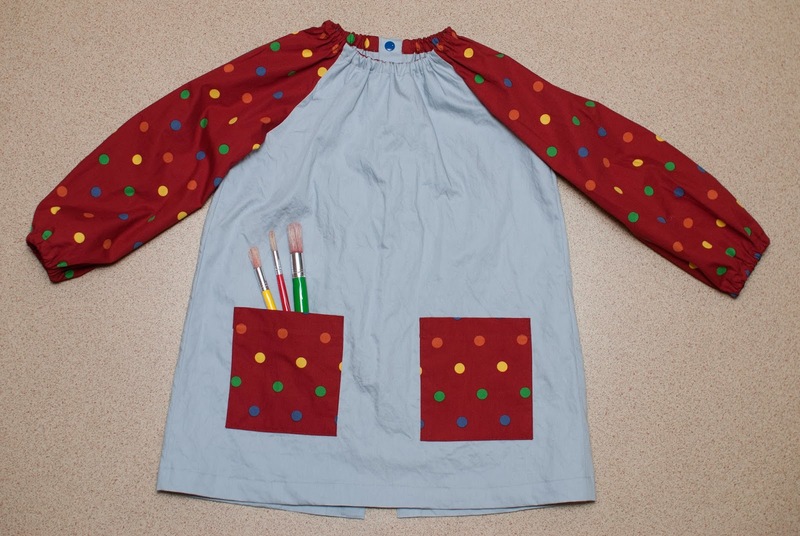 We love our art smocks and use them all the time! I'm working on a little things project right now. Just tracing the pattern, but I am getting really excited about it! I'm using some questionable fabric, so my fingers are crossed. We'll see! Oooh, you've got me curious. Looking forward to seeing what you make. Cute! I loved the finished on this, too. This smock might be the most-worn items I've ever made my daughter. She uses it for art now, but we mostly used a cover-all bib when she was younger. Guess it's time to make my little guy one too, as we get ready to introduce solids. the art smock is so awesome! and way to go with creating a group that's flourishing! how cool is that! Thanks Rachel. I get absurdly excited when I see that people have joined in, or added the button to their blog. I'm like an evangelist for sewing little things that you probably didn't need in the first place! Your art smock looks great!!! It really is a fabulous pattern. Thanks Pam. I can sniff disdainfully at those cheap, nasty ones I see in shops now. Definitely worth sewing my own! Welcome! If I had time I'd update the scoreboard every day! It makes me so happy to see things like your owl backpack. Very nice! I have these on my to do list :) Love that you used snaps too! Thank you. I love my snap press for things like this. I almost wished I had a snap colour to match every polka dot colour. The art smock looks fabulous! I love those polka dots!